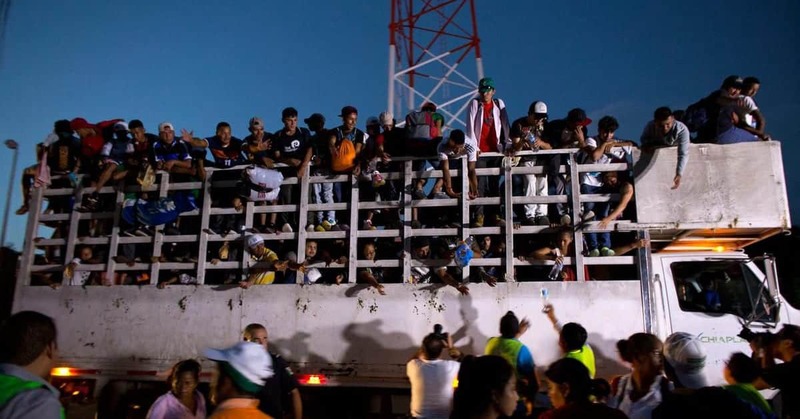 Is President Trump’s Asylee Policy for Central American Caravanners Unconstitutional? A federal judge in San Francisco has blocked President Trump’s November 8 directive stipulating that requests for asylum must be made at a port of entry. The judge’s action follows a jaw-dropping November 1 lawsuit from lawyers representing 12 Honduran migrants. They filed suit in U.S. District Court for the District of Columbia opposing President Trump’s announced asylum policy. The petition accused the President of unconstitutional abuse of the caravanners’ rights to exercise “their lawful right to seek asylum in the United States.” At the time, the plaintiffs were more than 500 miles from the U.S. border. Are their claims valid? Let’s look at the facts. First, do the Central American migrants meet the basic criteria for protection under the existing asylum statute? Second, has the President overstepped his authority by issuing a directive that applicants must apply at a port of entry? If both answers are no, then perhaps President Trump is correct in his handling of the matter. Then we would owe him a national thank-you. If the answers are yes, we would have a major problem of a president overstepping his authority. Reacting to what he described as an invasion, President Trump deployed 5,000 troops to the Mexican border to install barbwire fences and other barricades to impede the estimated 7-10,000 migrants from entering the country; he issued a directive that asylee applicants must apply at ports of entry. Trump detractors accused him of using the caravan as part of his midterm strategy to elect Republicans. They have blasted him for ceasing to talk about the caravan after the midterm elections. His supporters say the President has already taken strong deterrence measures; what else is there to say? Foreigners coming to the U.S. are admitted as “immigrant” or “non-immigrant.” Asylees and refugees are a different category. Asylum is a special category for immigrant admissions that differs from the normal visa categories for legal entrants. Under U.S. laws, an asylee is a “foreign national in the United States or at a port of entry who is unable or unwilling to return to his or her country of nationality, or to seek the protection of that country because of persecution or a well-founded fear of persecution. Persecution or the fear thereof must be based on religion, nationality, membership in a particular social group or political opinion.” The criteria for asylum says nothing about fear of gang violence, domestic abuse, impoverished living conditions or desire for employment. In 2016, Stephen Dinan of the Washington Times reported, “Nearly one out of every 10 illegal immigrants crossing the southwest border” was demanding asylum, using what he described as “‘magic words’ to claim they fear their home country, and turning a program intended to be a humanitarian lifeline into a new path for unauthorized migrants to gain a foothold in the U.S.” The claimants went from 5,000 in 2009 to 94,000 in 2016. This prompted Attorney General Jeff Sessions to issue a June 11, 2018 ruling announcing the Trump Administration’s return to existing law on asylees, which was more restrictive than the Obama Administration’s expansion to include domestic violence and gang-related fears. Sessions noted that an “An alien may suffer threats and violence in a foreign country for any number of reasons relating to her social, economic, family or other personal circumstances,” but this would not be covered under the asylum statute. Perhaps, the President acted decisively because our nation faces a crisis fueled by Leftist lawyers and socialists that some observers say are behind the caravan from Central America. The caravan’s existence took the asylee problem to a new level of escalation. Not acting would encourage more illegal migration from would-be asylum seekers. There’s also the matter of fairness to the thousands of other foreign-born people waiting their turn to legally enter the U.S. What would it say to them had the U.S. government allowed thousands of people traveling en masse to leapfrog over those seeking to follow U.S. law? Lawyers for the caravan migrants have accused the President of violating existing asylee law by pointing out that the asylee statute says a person can apply within the country, as well as at a port of entry. Perhaps, the caravan lawyers’ textual analysis is legitimate on its face. However, I believe the President could remedy this problem by modifying his November 8 directive by offering additional clarifying language. The new language might re-emphasize that the directive applies to the threat posed by the caravan of thousands camped outside the Mexican border and the entrepreneurial members who break off and enter through other locations. Even if the asylees were allowed to enter the country to apply, the overwhelming majority would not be allowed to remain and their presence would tax and already overburdened system. According to immigration asylee records over 75 percent of Central Americans’s asylee claims are denied. Given that this is the case, President’s Trump’s actions are reasonable and rationale. Likewise, the liberal judge’s ban of Trump’s directive has become a usual and customary reaction to the President’s actions.